Welcome to Pasadena, Maryland! The charming Maryland suburb is only a short drive away from major cities like Baltimore and Annapolis. Its location provides residents with easy access to both cities for work or weekend attractions while maintaining the appealing low-pace culture of the suburbs. Home to over 24,000 people, Pasadena, Maryland, has a strong sense of community. If you are in the market for a custom home builder in Pasadena, Maryland, Cedar Square Homes is the best choice! We use our combined knowledge and experience to guide customers through each project and provide expert insight for every decision. Many projects involve several stages and we will break down each complex step for our clients, keeping customers involved in every decision for their home. Our team can do everything, from extensive kitchen remodeling to roof shingle replacement. 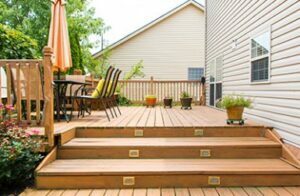 Additional space and aesthetic appeal are just some of the benefits from new deck installation. Cedar Square Homes repairs and builds custom decks for the Pasadena community. Carefully crafted with the finest materials, our decks will encourage homeowners to spend more time outdoors and make use of their backyards. The use of premium building materials helps our decks combat the elements and ensures a long lifespan for the structure. Though it is often overlooked, siding is one of the most influential elements of the home structure. It simultaneously protects the home from water damage and polishes the exterior appearance. Frequent assessment and periodic repair of your siding is essential towards increasing the lifespan of your home. Inefficient or flawed siding absorbs water, weakens the building frame, and create the environment for mold growth. Siding is a significant element of the home. Cedar Square Homes is highly experienced with siding installation. We specifically use Dutch lap vinyl siding for all projects due to the material’s durability. Dutch lap vinyl siding also requires less maintenance over time. Connect with our team to get started today! Cedar Square Homes is the resource you need for custom home building services in Pasadena, Maryland. From siding repair to home additions, we have the skills needed to complete a variety of home projects. For more information, please contact our team or explore our service pages.